NagoyaHammer.com • View topic - Kickstarter - Reaper Bones 4!!!! Kickstarter - Reaper Bones 4!!!! 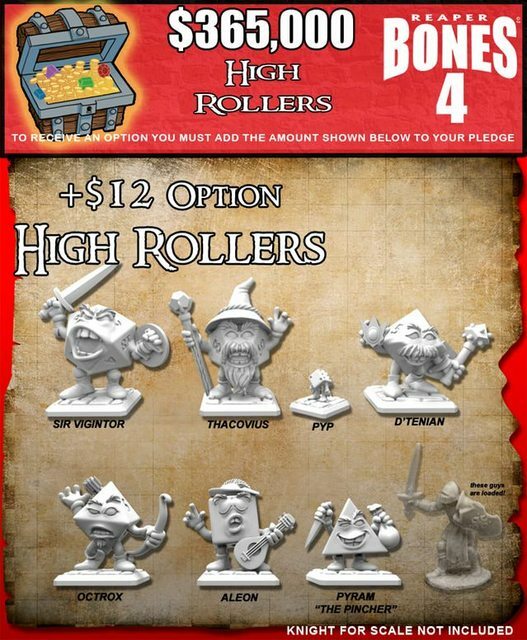 Reaper is launching their 4th Bones Kickstarter on August 1st. I realize that this is probably only of interest to me, but I figured I'd mention it just in case. I'm tempted to get two of those huts and chop the legs off one so that I can use it as terrain. Re: Kickstarter - Reaper Bones 4!!!! And the KS is live. Half a day in and it's up to half a million dollars already. A bunch of stretch goals have already been unlocked, with more on the way. (The previous KS went to just under 3 million dollars). The current $100 dollar core pledge already includes some heroes, a huge dragon, some goblins, some minitaurs (no, not a typo) and a couple of villains. Plus a pig powered pumpkin cart. There are some great looking add ons and some great looking monsters have been previewed for further down the line. I don't need these and I have no idea what I would use them for, but these are the most meta D&D figures ever. Talking to myself here probably, but the Bones 4 KS ends this weekend. They're pushing up close to the 2 million dollar mark and the last 48 hours usually see a stretch goal or 10 get blown through. The core selection includes some awesome goodies and there are some pretty nifty looking options such as an SF pack, loads of big monsters and a Pre-Historic pack. Go take a look! I'm probably going to max out my hobby budget on this one. Impressive how their previous campaign reached $3 mil. Thanks for sharing the info.